For the first installment of our Monday Morning Football series, we are featuring a custom fantasy football trophy we recently made for TSN (The Sports Network). For those of you who are unaware, TSN is the ESPN of Canada…kind of a big deal. TSN contacted us in need of a custom trophy and in need of one fast. They had plans to shoot a commercial featuring their trophy in a week, which left us very little time to design, build, and ship the award from Miami, Florida all the way to Canada. We had about three days to pull the whole thing together, a seemingly impossible timeline for a custom award like this, but at Far Out Awards we make the impossible possible so naturally I told them we’d get it done. Over the next few days, I worked closely with the senior manager at TSN to build the fantasy trophy of their dreams. TSN wanted their very own “Shiva” (as I explained in our last post, The Shiva has become an icon for fantasy football fans everywhere); they were inspired by the size of the Shiva and also wanted to incorporate a photo into the award’s design. They loved it. I mean, could you blame them? It was a great starting point, but there were some big changes to be made. For starters, as TSN’s fantasy football league is sponsored by Coors Light, they wanted all the traditional gold details to be silver. We would finish the football on the top of the award in a shiny metallic silver and add a Coors Light decal on the side of the football. The green columns would be replaced with red to better reflect Coors Light and TSN. They liked the football helmet details but to remain impartial, they wanted us to paint the helmets all white- which would also incorporate the Coors colors and really make their logo pop. In the middle of the award we would sublimate a photo of the league’s winner from the previous season, with the word “CHAMP” directly below. Far Out! Despite the short notice, we managed to pull it all off. After this picture we tweaked the helmets a bit (turning them on an angle) and the Coors Light decal was added. If you live in Canada, you’ve probably seen the final result on TV, as TSN commercials have been flaunting their Far Out Award non-stop. If you don’t live in Canada, you can catch their commercials on their youtube channel https://www.youtube.com/user/TSNCanada. If you are looking for a custom fantasy award of your own, start by filling out the form on the bottom of the custom awards page or call us directly at 305-974-4198. 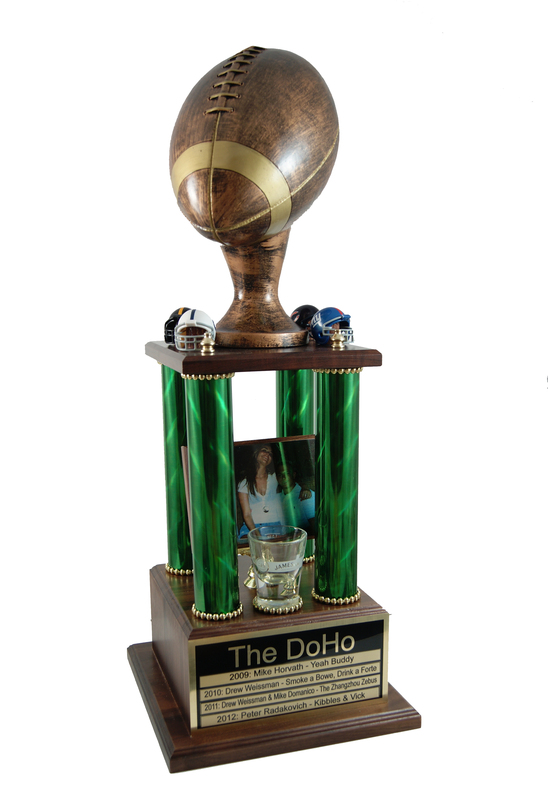 If you have your dream fantasy trophy already built in your mind, we will bring it to life. If you’re not quite the artistic visionary but know you want something epic, we will help you design your award from the ground up so it reflects you, your league, and everything that’s important to you (be that beer, bacon, wings, horticulture, whatever). If you’ve already purchased a custom award from us and want to share you story on the Far Out Blog, contact lindsey@faroutawards.com.